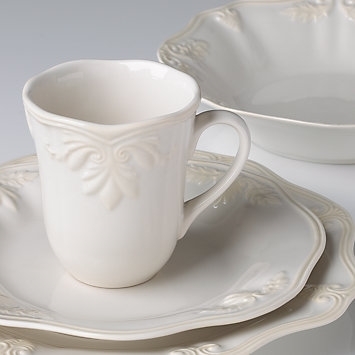 Elegant scalloped edges distinquish each piece in the Butler's Pantry Gourmet 4-pc Place Setting. And each piece is accented with details, including graceful scrollwork. Diameter of dinner plate: 12", accent plate: 9", bowl: 9", capacity of mug: 14 oz.